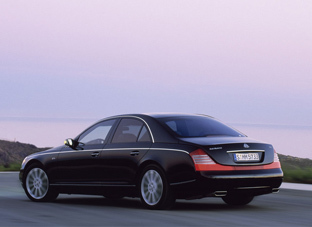 The Maybach 57 S is intended as the 'sporty' model in the Maybach range. The 57 S was designed to be driven by the owners as often as they might be chauffered, unlike the limo-esque Maybach 62 and slightly smaller Maybach 57. The Maybach 57 S is powered by a 6 litre twin turbo V12 developing over 600 horsepower and 738 ft-lbs of torque, giving the car an electronically limited top speed of 170 mph and a 0-60 mph time of just 5.0 seconds. 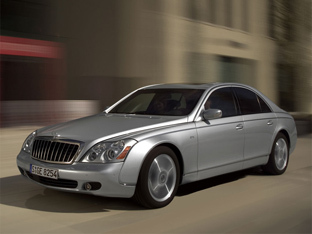 Differences between the standard Maybach 57 and the 57 S include a modified front end with a strikingly redesigned radiator and lighting units, attractive 20-inch spoked wheels, discreet "57 S" lettering on the wing beneath the A-pillars and on the boot lid, and single-tone paintwork in the black or silver colour tone reserved for the 57 S model. At the rear a redesigned apron with two new, trapezoidal exhaust tailpipes subtly indicates the high performance potential of the 57 S.